My well-marked copy of the book. I’ve been reading a recently published book on the changes that have been happening on how and where we work. 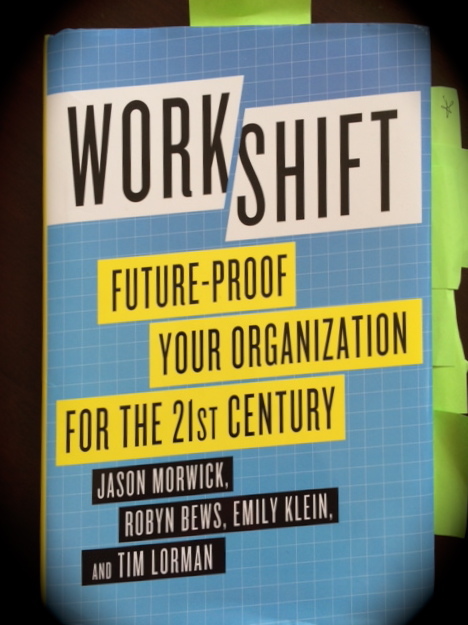 It’s called Workshift: Future-Proof Your Organization for the 21st Century by Jason Morwick, Robyn Bews, Emily Klein and Tim Lorman. The book defines workshift as “working where and when we are most effective”. In our traditionally corporate 9-5 world, getting to workshift in organizations is like cruising around a funhouse. The challenge of finding the exit includes surprises around each corner and distorted perceptions of convention. This book delves into the journey of workshifting, its various stages, the obstacles faced during those stages, and gives readers successful approaches and tools on how to continue on a successful workshift journey for your company. My own transition started over 10 years ago when I left a corporate position working in a traditional office. I struggled when I returned to the workforce as a consultant – the freedom of being a flexible worker at odds with the expectation of doing my consulting work in the client’s office (even though everything I needed to complete my job was neatly organized in my home office). I was not working where I was most effective, nor when I was most effective. I was working where the people who paid me could see me. I lost two hours of my most productive work time to commute time, and another half hour packing my gear and setting up in a new work space. As someone who billed on an hourly basis, this wasn’t effective for me anymore. I needed something better. This farce of flexibility, coupled with the frustrating and fuzzy “neither here, nor there” feeling of belonging nowhere, led to a deviation from consulting work to create Flipside Workspace. This was a way to “fix” the problems flexible workers face. I became a teleworker, running a virtual company that creates products to help other remote workers. I live and breathe the workshift concept. What I’ve learned along the way is the solution for a better way to work requires three things: the right tools, the right attitude for the employee, and the right framework from the employer. Creating the right tool that worked for us was the easy part. Truthfully, it’s taken me a long time to fully embrace workshifting, to leave the guilt at the door, to feel respected and valued in the workforce with my “work at home” status. On the other hand, this alternative workstyle has allowed me to continue to work in an industry I love, to grow professionally, to learn new skills, to run a business, and even build a product that makes the shift to workshifting easier for those individuals and businesses that are struggling with the transition. This has been part of my own personal journey. Workshifting works for individuals and for companies, but getting there requires a plan. Based on my own experience, I believe this book will benefit any business, no matter what stage, in creating that framework to make workshift happen in their workplace, wherever that may be. This entry was posted in Digital Workplace Concepts and tagged business challenges, flipside workspace, work from home, Work–life balance. Bookmark the permalink.